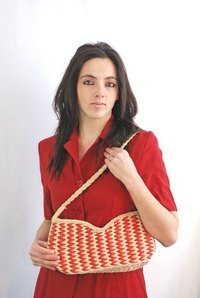 A pocketbook is a structured handbag or purse used for carrying money, cards and other small items. A polyester pocketbook can be cleaned to restore its original appearance should it become stained, soiled or dingy. To maintain the shape and appearance of your pocketbook, wash by hand. For stubborn stains, take your pocketbook to a drycleaner for professional cleaning. Dampen your washcloth and add a small amount of detergent to the cloth. Spot clean the pocketbook in areas that require extra cleaning. Dab the stains with the moist, soapy cloth and rub gently to lift the mark. Fill the wash basin with warm water. Add a scoop of detergent and and mix thoroughly. Add the bleach if your pocketbook is white. Skip this step if the pocketbook is a print or any other color. Add the pocketbook to the basin of water and thoroughly saturate it in soapy water. Massage the soapy water into the fabric. Avoid scrunching or crumpling the fabric as this can distort the shape of the pocketbook. Instead, gently rub the fabric to clean it. Remove the pocketbook from the basin and hold under running water to rinse out the soapy water. Press the pocketbook between your palms to remove excess water. Do not wring the fabric, as this can ruin its appearance. Lay the fabric flat on a towel to dry. Allow to air dry completely. If necessary, press the pocketbook with an iron set to low. This will remove any creases caused during the washing process.